It’s time to begin a few indoor gardening projects. 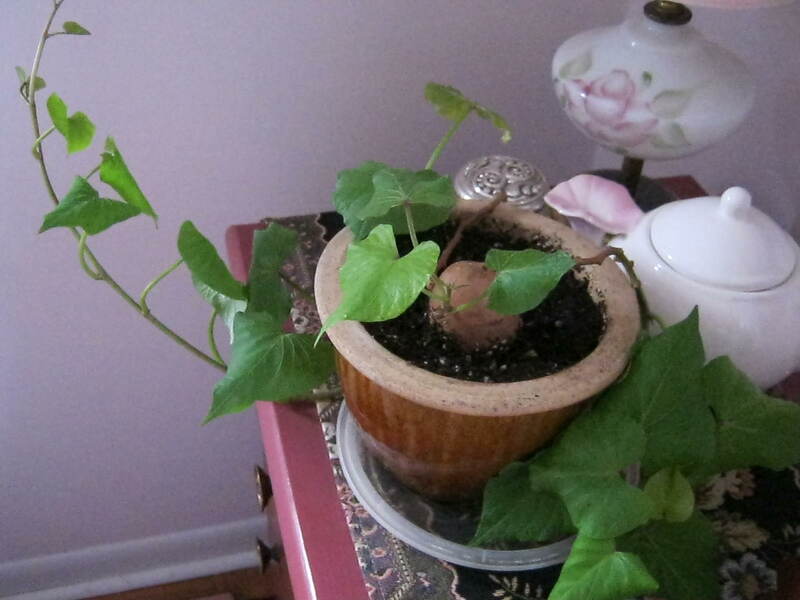 At the top of my list is growing a sweet potato plant with my grandchildren. Growing a sweet potato is easy. Buy a good-sized sweet potato or yam from a farm or organic market; they are less likely to be treated with chemicals to prevent sprouting. Insert three or four toothpicks around the widest circumference and place the bottom in water. A flower vase with a slender neck is the perfect container to choose. The tuber grows quickly and develops a large root system. In just over a month it will be ready for planting in a pot of soil. I left a portion of the tuber above the soil line. I think it adds a bit of interest to the look of the plant. I also like the way the tuber mirrors the golden-orange brown of the pot’s ceramic finish. 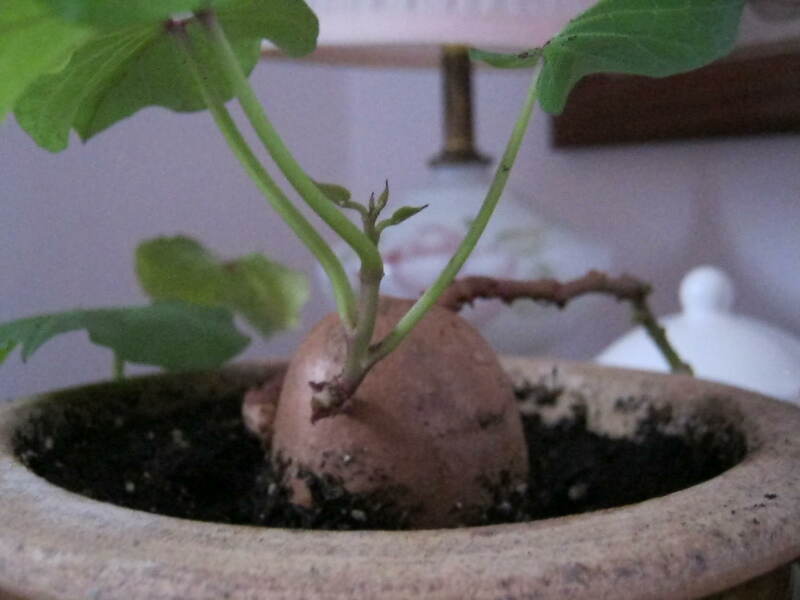 Growing a sweet potato is a fun and easy project for Autumn or Winter. I just happened upon your site. Love the potato vine in a jar! I just started one myself. If I am not mistaken, you can take off the slips from the sweet potato that is not growing it’s own roots and plant the slips themselves. They should root fairly easily. 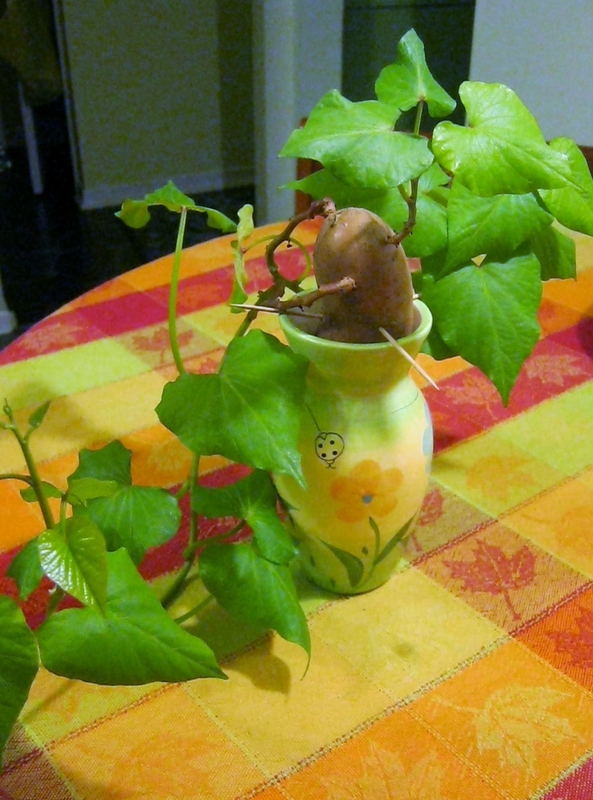 I have tired three sweet potatoes and yes they grew leaves ect and roots but do not sprout out like yours do in your pictures ? The tubbers grow tall and upright at which I have plucked them and rooted into another jar of water . Do you know why mine aren’t growing the way yours are ? Also, the small sprouts need quite a bit of time to get large and lush and really look like a houseplant…I think giving them time is what yours might need. I hope one or the other of my answers is the right one for your question. Thanks for posting. I would love to try to grow these. Thanks for sharing the beautiful pictures. They are easy Susie. It’s best to get one that has not been treated to prevent sprouting. Try to find an organic one…they wouldn’t have chemicals on them to prevent sprouts. I always sprout mine in a large glass container so you can see the roots grow. One of my kids favorite memories. This is a wonderful experience for children. They need to get off the keyboard and iphone more often. Most don’t even know how to use basic household tools. Kinds don’t make things anymore even if just arts and crafts. Thanks visit my blog.